An effective angler knows that you need to match your fly to what the fish are eating. While there are a tremendous amount of food and fly choices for fish, they are not available all at once. Water temperature, amount of daylight hours, time of year….all of these things influence what is available for fish to eat. Aquatic insects, by far, make up the main diet of most fresh water fish species, trout being the most noteworthy. It's helpful to know the four main insect orders and their respective life stages. 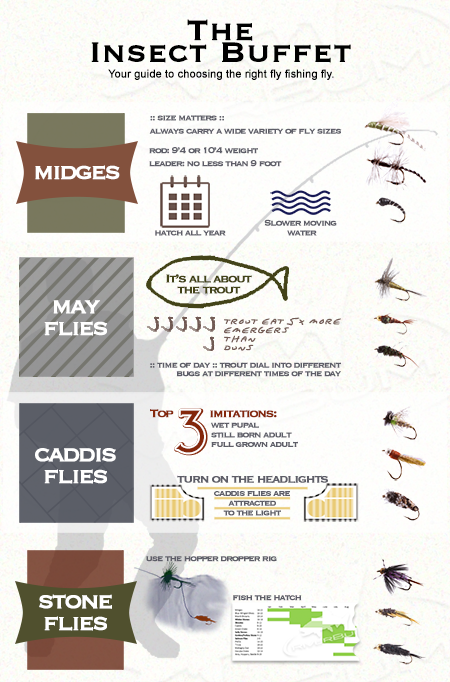 In our four-part newsletter series, you'll find out about the four main insects: midges, mayflies, caddis flies, and stoneflies. You'll learn what time of year to fish each one, what to look for, and tips and tricks to catch the fish you're after. Sign up here. Put the odds in your favor, and you’ll catch more fish. That, my friend, is how you can conquer the smorgasbord of flies out there and choose the right ones to take to the river - the ones that are going to give you the highest probability of success on the river!